The Indiana Chapter, founded in 1982, is based in Indianapolis. For more information, please call 317-824-0940 or email afpic@nashams.com. The Chapter Ten Star Award honors those chapters that align their objectives with AFP's current strategic plan and encourages them to perform specific activities designed to increase professionalism within the profession, as well as public awareness of the importance of philanthropy. 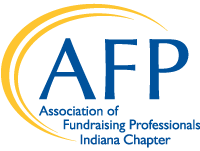 The Association of Fundraising Professionals Indiana Chapter fosters the growth of development of philanthropy, the fundraising profession, the Chapter, and its individual members. The vision of the Association Fundraising Professionals Indiana Chapter is to achieve its mission through research, education and training, adherence to a code of ethical principles, and high standards of professional practice. The AFP Indiana Chapter seeks to enable its members and affiliated organizations to better serve society and its diverse communities through inspired advocacy of voluntary actions for the common good.